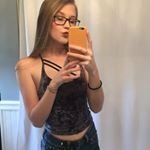 Toronto '18 | OSU '22 I am super interested in makeup and trying new things out! Also, I've been getting into skin care, health, and fitness! I absolutely love Brandy because it is my style. The clothes are very minimalistic and simple, but very cute which is something I love! I only buy one thing when I shop though because I can’t justify the price of a plain white T-shirt being $18 when I can go somewhere else for the same exact thing for a better price. I love the clothes and experience, but it’s just expensive. This was my first Vs fragrance purchase I have ever made and I was very happy with it! It is a body spray so it isn’t as strong or long wearing as a perfume. It has a great scent and I would recommend this to anyone that wants a subtle scent for the day. I gave it 3 stars just because I prefer perfumes now, but it is still an amazing product! I used to wear this spray all the time in junior high. This was my all time favorite scent and I loved it! Compared to other VS fragrances it doesn’t live up to my expectations anymore. However, this is a body spray and not a perfume, so I’m not expecting the scent to stay for a long time or to be very strong. I personally love this scent and I still use it occasionally, but I’m more into perfume now, but if your like a subtle scent then I highly recommend this! I am absolutely in love with this perfume!! I use this every single day and I don’t think I will ever use a different one. The scent is amazing and it is very long lasting. I’ve had mine for a year and a half and I still have so much of it left; that being said, I truly believe it is worth the money because it will last you a really long time and it is an amazing product! I’ve always loved shopping in Hollister, they have super cute clothes and they are my style. However, it is a pricier store so I tend to not go in there a lot unless I find something on sale. I just wish I could go in and buy a few things without spending a ton of money. I have mixed feelings about H&M, but it is most likely just the one I shop at in the mall. Sometimes I go in and find some amazing pieces and other times I find nothing. Although I do feel like I’ll go in and it’s almost like they never have anything new, but again it may just be my store. However, I do feel like a lot of things are a little overpriced. Overall, I enjoy going in there to have a look. I absolutely love this store! It has a bunch of my favorite brands and it is totally my style! I just hate how expensive everything is so I usually only buy 1 thing in there maybe a couple times a year and it has to be something I’m absolutely in love with.